Don’t let an ugly driveway steal your home’s beauty. If not done right, concrete can look bland. Did you know you can achieve the expensive look of brick or stone but at a cheaper cost using concrete? You can also add colors and designs to make your driveway look decorative in addition to practical. 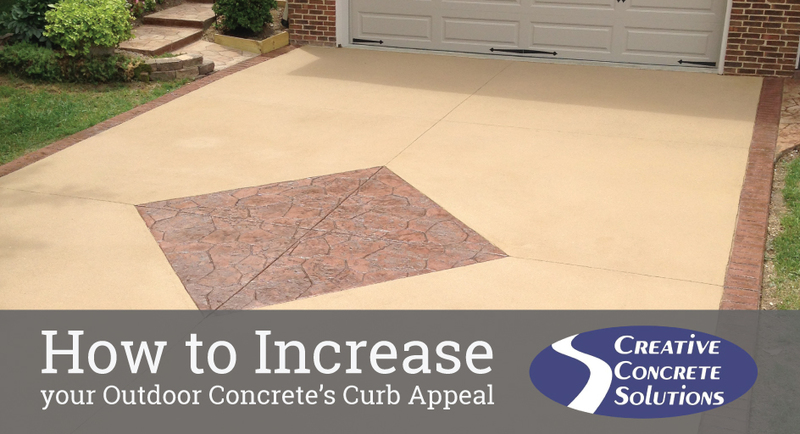 Why did you initially choose to have a concrete driveway? Probably because it looks better than gravel and isn’t messy. But after years of parking cars and ice buildup in the winter, that driveway starts to not look so good. A cracked driveway can lower the curb appeal of your home. Luckily, replacing it isn’t your only option. Instead, you can consider these options of upgrading your concrete and making your home look amazing again. Adding color doesn’t necessarily mean turning your driveway purple or yellow. Instead, you can give your concrete some dimension with layers to produce a multi-colored look. Another option would be to stain the concrete and have a pattern engraved into it such as a brick pattern or even something like your family name or crest. Or if you are looking for a real attention grabber, you could go with bright colors like green or orange. The choice is up to you. Aggregate is the coarse materials like sand, stones, or recycled concrete that make up 60 to 75 percent of a concrete mixture’s volume and is typically covered up by cement paste. To create an interesting color, you can choose to expose the aggregate by scrubbing away the top layer of cement paste with a chemical surface retarder. Popular options are to add crushed seashells and colored glass to the aggregate by either adding them to the surface of the concrete or by blending them into the concrete. There are multiple ways to cut designs into concrete such as by sawing, scoring, or engraving. You can either stain the surface and etch a design into the concrete or actually cut into the concrete to create patterns like squares, circles, or rectangles. Think of concrete overlay as makeup foundation with amazing coverage. If your concrete is stable but just needs help looking good, consider an overlay which will coat the concrete’s surface and help with discolored or pitted concrete by covering any blemishes. To either install concrete or upgrade what you already have, contact Creative Concrete today to get a free consultation for your project.